Spain's prime minister said Friday his government is preparing emergency measures to preserve the rights of Britons in Spain in the event of the UK leaving the European Union without a deal. 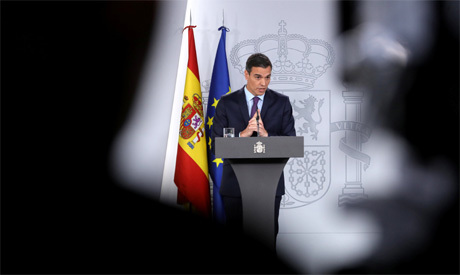 "I want to sent a message of calm to Spaniards who live in Britain and also to Britons who live in Spain: their rights will be maintained whatever the scenario," Prime Minister Pedro Sanchez told a year-end news conference following a weekly cabinet meeting. The government will adopt measures by a decree-law which will be presented at the beginning of February "at the latest" that will ensure Britons would keep their rights even if Britain leaves the EU without a deal as long as Spaniards get the same treatment in Britain, he added. The measures, which have been drawn up in "close cooperation" with Brussels and other EU member states, will also protect bilateral trade ties, the prime minister added. There are dozens of locally elected British town and city councillors in Spain, mostly along the country's southern coast. Officially, over 300,000 Britons reside in Spain, but many do not bother to register, with estimates suggesting between 800,000 to a million live in the country. Around 115,000 Spaniards are registered as living in Britain.